Like so many people, I was devastated by the news of Robin Williams' suicide. I had had the sheer joy of interviewing him, and he'd also done a hilarious bit about colonoscopies at a benefit I hosted for colon cancer awareness back in 2002. Robin and I shared the belief that laughter really is the best medicine, and to honor his memory, I want to share that performance with you all today. You'll find that video above. When I heard about Robin's diagnosis of Parkinson's, it was doubly heartbreaking. My father dealt with the disease for more than a decade before his death three years ago, and Michael J. Fox is one of my heroes. This latest news about Robin made me want to learn more about the connection between Parkinson's and depression, so I reached out to psychiatrist Dr. Harold Koplewicz, president of the Child Mind Institute and a leader in mental health research. First of all, what is Parkinson's disease? Parkinson's disease is a degenerative nervous system disorder in which brain cells that produce an important chemical called dopamine slowly die off over time, and abnormal deposits of protein spread across the brain. The onset is usually after the age of 50 and common symptoms include shaking, trembling, and trouble walking. Later, the disease begins to affect cognitive and behavioral functioning and can lead to dementia. We don't know what causes Parkinson's, and though there are promising treatments there is no cure. Obviously a diagnosis can be devastating, but can the brain chemistry changes associated with Parkinson's also exacerbate depression? Yes, definitely. Although we are still figuring out Parkinson's disease and the brain in general, we know dopamine is tightly associated with our mood and feelings, in addition to our control of our body. The dopamine system helps us feel happy, or satisfied, when we achieve something. When it doesn't function properly, those "rewards" can be hard to achieve — a classic sign of depression. Depression is the chief psychiatric symptom of Parkinson's, separate and apart from the real sadness and grief that can accompany such a serious diagnosis. 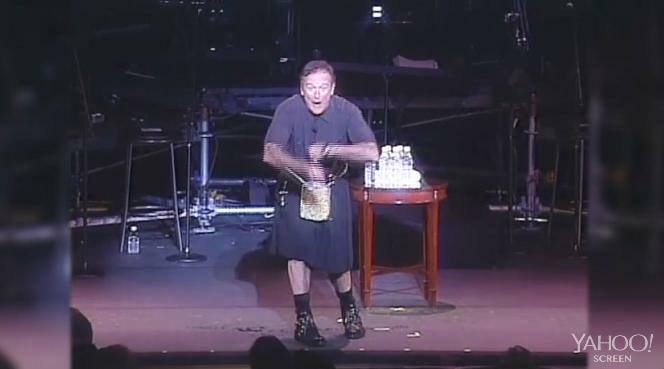 Robin Williams also had issues with substance abuse. Can you explain the role depression can have on substance abuse? First, an interesting fact is that the dopamine system, which helps us feel good, is also implicated in addiction. Many drugs of abuse artificially increase dopamine levels in the brain and eventually "desensitize" the system — so much so that you need to keep taking more drugs just to maintain a level of function. As for depression, it is often linked to substance abuse. People with clinical depression often "self-medicate" with a variety of substances that affect levels of neurotransmitters in the brain and the central nervous system, just like our medications do. But self-medicating can be disastrous, and also all over the map. If we look at Robin Williams, we see everything from cocaine addiction — dependence on a stimulant — to alcoholism — dependence on a depressant. For people with serious depression, their bodies know that something isn't right, and turning to drugs of abuse is an answer of sorts, but the wrong one. Tragedies like this often focus attention on important issues, like depression. What can be learned from Robin Williams' death? Simple: Living with substance abuse and depression is terribly hard. First we need to respect Robin Williams, his family, and his friends. Think about 40 or more years living while struggling with these problems, but also having a family, success, and some amount of happiness, sobriety, and recovery. Then, think about how insidious these diseases are. I know that identifying and treating depression and substance abuse early can literally change the course of a life. Depression is real, common, and treatable. It usually starts in adolescence, and each untreated episode puts the individual at a higher risk for additional episodes. The best lesson to take away is that we all need to be better informed about brain diseases like depression, Parkinson's, and substance abuse, proactive about helping our loved ones, and dedicated to finding better treatments. Is depression more widespread than it used to be? We can't really know, but hopefully more people are aware of how devastating this disease can be, and more people are getting treatment. It is definitely true that the environment — social factors, life stresses, etc. — plays a role in depression. Many psychiatric disorders have what we call "biopsychosocial" causes; that is, there is a biological or genetic component, a psychological component, and a social component. Depression affects more than 2 million adolescents and increases their risk for suicide. Every year approximately 600,000 teens make a suicide attempt that requires an emergency room visit. Nearly 5,000 young people will commit suicide this year, with depression being the number one cause. There are some who believe we're an overmedicated society. What would you say about that? Are there people on certain psychiatric medications who should not be taking them, or instead taking different medications? Yes. We need to get better about properly identifying and treating psychiatric disorders, particularly in children, whose symptoms are often so complex that they can be difficult to diagnose. But there are so many people with these diseases who aren't diagnosed and who don't get effective treatment because of misinformation, stigma, and fear. Case in point: We know from Robin Williams' family and associates that he was struggling with depression. But though he was candid about his addictions, his heart troubles, he never spoke openly about his depression. It's also very important to note that antidepressant medications used to treat depression are not "feel good" drugs like alcohol and cocaine. Antidepressants work gradually to change levels of neurotransmitters like serotonin and dopamine, often taking four to six weeks to become effective. They are intended for the long-term management of a chronic disease — depression — not short-term escape. What resources are out there for people who need help? First off, as a child and adolescent psychiatrist, I have to say that depression in children and adolescents is particularly dangerous. Suicide is the third leading cause of death in people aged 10 to 24, so if you're concerned about a young person you can get information on depression at Childmind.org. A great resource for adults with major depressive disorder, or friends and family members, is the American Psychiatric Association's page on depression at Psychiatry.org/depression. Finally, if you need help, are feeling hopeless, have thoughts of suicide, or just need someone to talk to for whatever reason, call the National Suicide Prevention Lifeline at 800-273-8255. Is My Baby Sad? Maybe. Pediatric Depression is a Serious Health Issue.